Indiana readers, note the date for the Indianapolis Youth Literature Conference! Authors Brian Pinkney, Andrea David Pinkney, and Patricia McCormick will be there! Oh yeah, the National Book Award winners were announced. 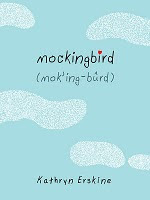 Congratulations to Kathryn Erskine, author of Mockingbird, winner in the Young People's Literature category! Check out the full list of nominees and winners. Picture books for boys? Mel's got ya covered. Do teens still read contemporary fiction? I didn't make it to our last teen advisory group meeting, but I think that if John Green, Sarah Dessen, and Maureen Johnson (and many others) disappeared from our library shelves, we would hear about it. Over the summer, I had a group of teen volunteers who could not stop talking about Pretty Little Liars. Sure, paranormal's hot right now and kids are devouring fantasy tomes as thick as phone books, but that doesn't mean there's no room for contemporary. It takes all kinds of books to make up a library. Thanks to Kelly of STACKED for the link. 2011 YA and Middle Grade debut authors, Kristi is looking for you! Yup, Kristi at The Story Siren will be hosting the debut author challenge for 2011 and she's looking for debut books to promote and deb authors willing to donate items to prize packs. If you've got a debut coming out in 2011, make sure Kristi knows about it! Dude, Save the Words. (OMG, I adopted a word last week and now I can't even remember what it was... I am so failing at Saving the Words...) Thanks to Leila at bookshelves of doom for the link. And Jaclyn Dolamore has a list of ten types of book reviews that make authors sad. Bloggers, have you done any of these? :) Thanks again to Kelly of STACKED for the link.